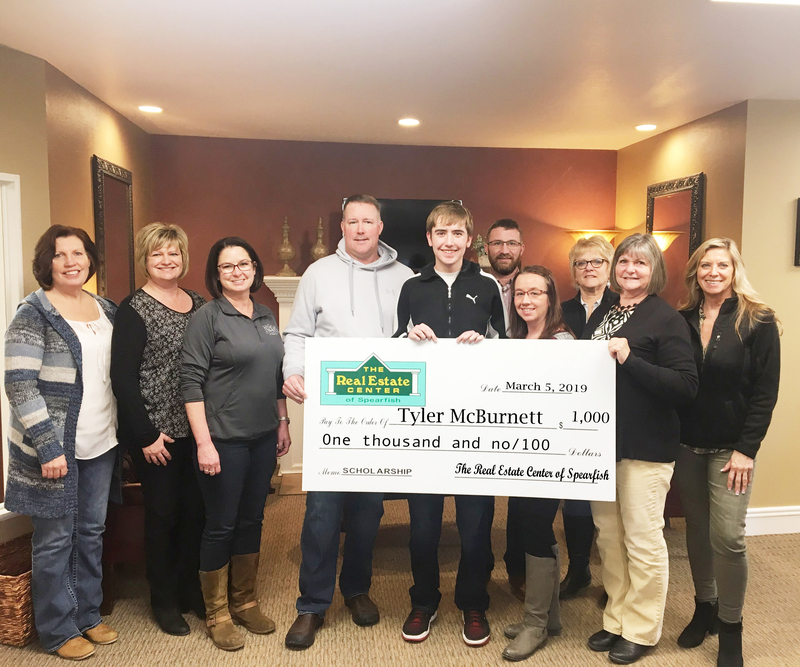 Spearfish high school senior, Tyler McBurnett, was recently awarded a $1,000 Sports Scholarship sponsored by the Real Estate Center of Spearfish! Scholarship Recipient will enroll at Black Hills State University in Mass Comminutions. And the WINNER is......Tyler McBurnett! The Sports Scholarship drawing took place during the Girls halftime game on Thursday, February 21st! Those who qualified were: Jake Powell, Tim Doerges, Jordan Blinson, Taya Lucas, Hannah Laher, Shelby Swets, Alena Hoven, Rachell Woods and Tyler McBurnett. Thank you all for participating! Seniors don't forget you have another chance at a Scholastic Scholarship! Details below! 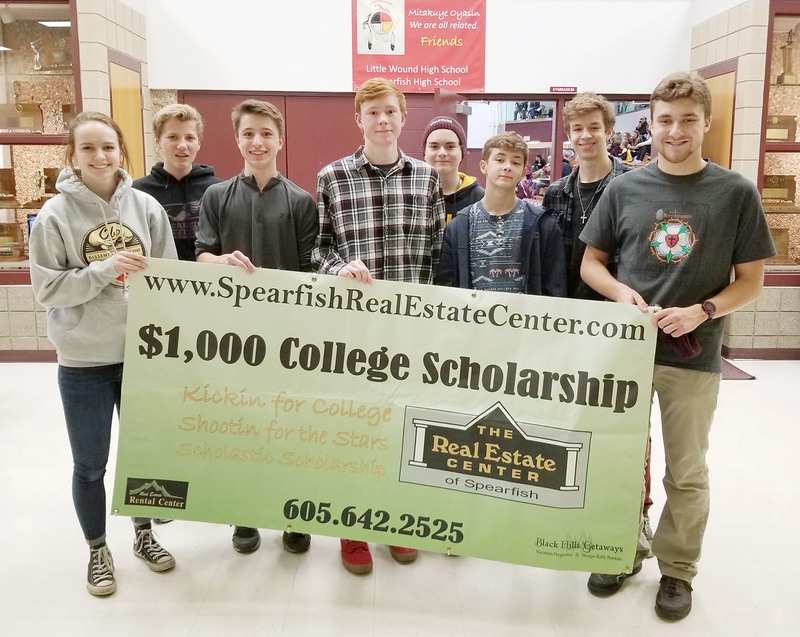 The Real Estate Center of Spearfish is also offering a $1,000 Scholastic Scholarship to a qualified senior graduating in 2019. Applications are available at the SHS guidance office or online at www.SpearfishRealEstateCenter.com. Deadline for application is April 15, 2019. 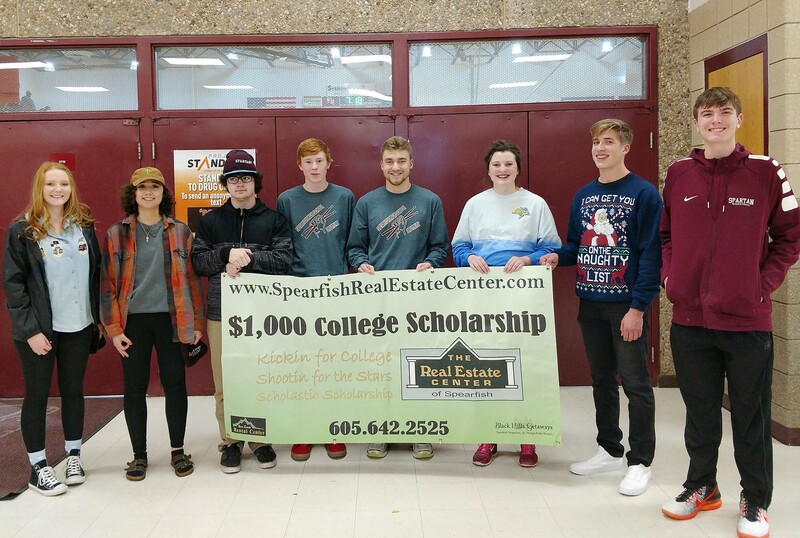 Over the past 13 years, the Real Estate Center of Spearfish has awarded $29,000 in College Scholarships to Spearfish High School students. Enthusiastic Spartan high school students lined up at a recent home basketball game for their chance to shoot a 3-point basket during half time! If they make the shot their name goes in the drawing for a $1,000 Scholarship sponsored by The Real Estate Center of Spearfish! The drawing will take place at the end of the basketball season. Congratulations to Tyler McBurnett for making the 3-point basket ! Students who competed for the 3-point basket include Bella Hawley, Logan Bunney, Savanna Sewell, Kaylene Delahoyde, Ashley Burr, Olivia Cihak, Derek Webster, Chandi Jackson, Zack Tipton, Mary George, Libby Niehaus, Brooklyn Zietlow, Diane Glasford, Evan Hehr, Jayden Hamann, Lillie Jerome and Madi Watts. You have a few more opportunities to shoot for a basket at the following home Spartan games: Feb. 7th, and 21st. The winners of The Real Estate Center stadium chairs were Jason Pelo and Robert Schulz! Keep Shootin for the Stars! Enthusiastic Spartan high school students lined up at a recent home basketball game for their chance to shoot a 3-point basket during half time! If they make the shot their name goes in the drawing for a $1,000 Scholarship sponsored by The Real Estate Center of Spearfish! The drawing will take place at the end of the basketball season. You have a few more opportunities to shoot for a basket at the following home Spartan games: Jan. 22nd, Feb. 7th, and 21st. The Real Estate Center of Spearfish also gives away Spearfish Spartans Stadium Chairs at halftime of both basketball games. Kickin Off the Season – Friday, August 31! Are you ready? 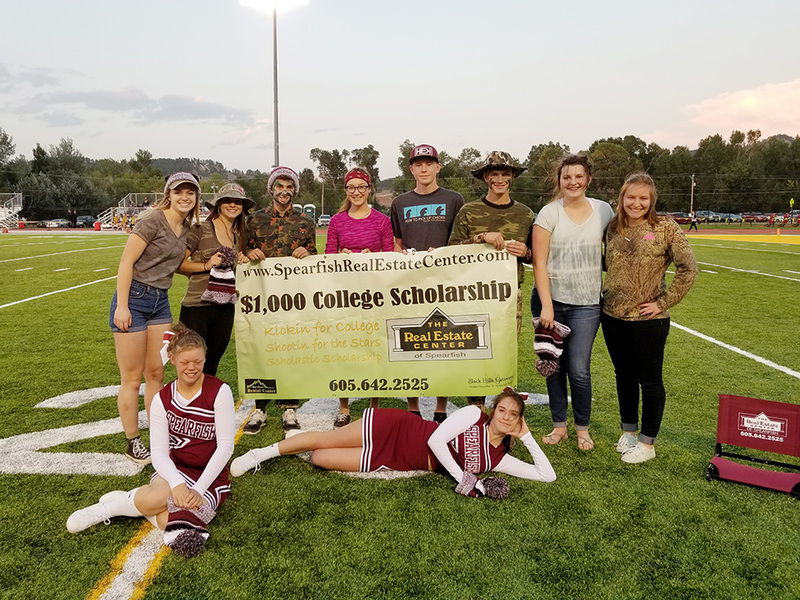 It is the start of another season of football, and the Real Estate Center of Spearfish is gearing up for their annual Kickin for College events! Please bring your student ID to the Spartan home football game on Friday, August 31 for your chance to kick a field goal. At half time, ten student names will be drawn and all students who make the field goal will be entered in the $1,000 COLLEGE SCHOLARSHIP drawing to be held at the end of the school year. All Spearfish High School Sophomore, Junior and Senior students are eligible to win. Scholarship money is to be used at the beginning of their second semester in the college of their choice. Come to the selected Spartan home football and basketball games. All Spearfish High School Students, who show their Student ID, will have the opportunity to enter their name into a drawing. At half-time, ten tickets will be chosen from that drawing. Those ten Students will get an opportunity to kick a field goal or shoot a basket. If they are successful, then their name goes into a drawing for the $1,000 Scholarship that will be drawn at the end of the basketball season. Only one name will be drawn from all of the entries and that Student will win $1,000 from the Real Estate Center of Spearfish, payable to the college (or vocational school) of their choice. Scholarship money is to be used at the beginning of their second semester in that school. 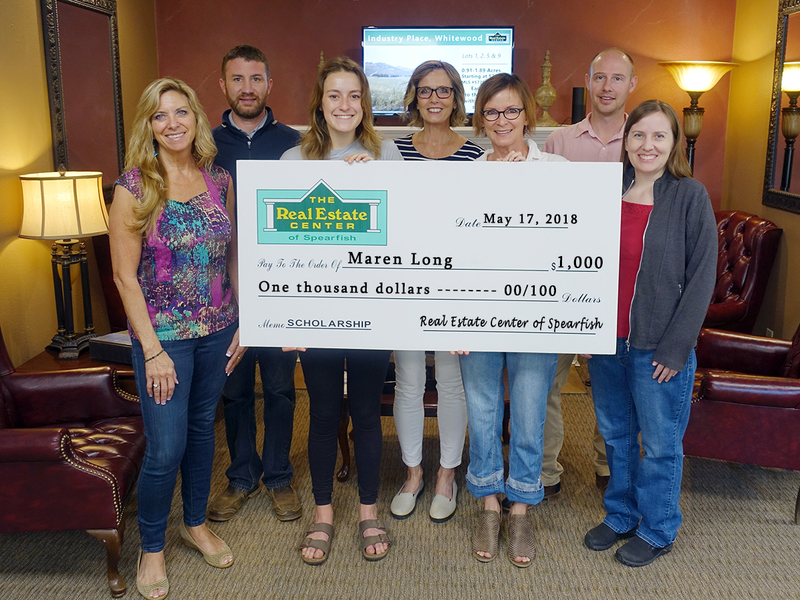 Spearfish high school senior, Maren Long, was recently awarded a $1,000 Scholastic Scholarship sponsored by the Real Estate Center of Spearfish! Maren is aspiring to become a Family Practice Physician and is currently enrolled at Boise State University in Health Sciences. (l-r) Sue Cramer (Owner/Managing Broker), Jason Richards (Owner/Broker Associate), Maren Long (Scholarship Recipient), Pattie Parrett (Broker Associate), Barbie Long (Recipient’s Mother), Kade Welfl (Owner/Broker Associate), and Stephanie Eddie (Broker Associate). the Real Estate Center by April 15, 2018. 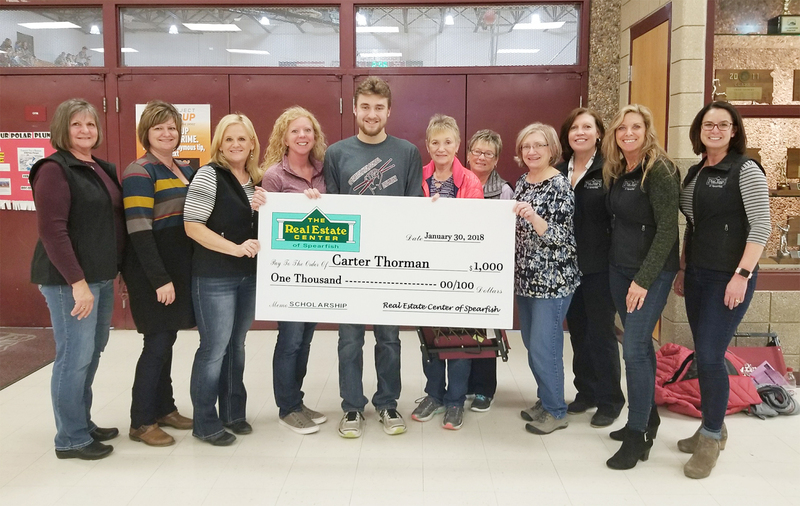 Congratulations to Carter Thorman, who was awarded the 2018 $1,000 College Scholarship sponsored by the Real Estate Center of Spearfish! Carter plans to attend Concordia University in Nebraska in the fall, where he will pursue a degree in Accounting and Pre-Seminary. Pictured: (l-r) Beth Mathis (Owner/Broker Associate), Kari Engen (Owner/Broker Associate), Lori Caldwell (Owner/Broker Associate), Toni Thorman (Mother of Scholarship Recipient), Carter Thorman (Scholarship Recipient), Sharon Thorman (Grandmother of Scholarship Recipient), Donna Hoy (Sister to Sharon Thorman), Vickie Shapiro (Sister to Sharon Thorman), LuAnn Bice (Broker Associate), Sue Cramer (Owner/Managing Broker), and Polly Garrett (Owner/Broker Associate). 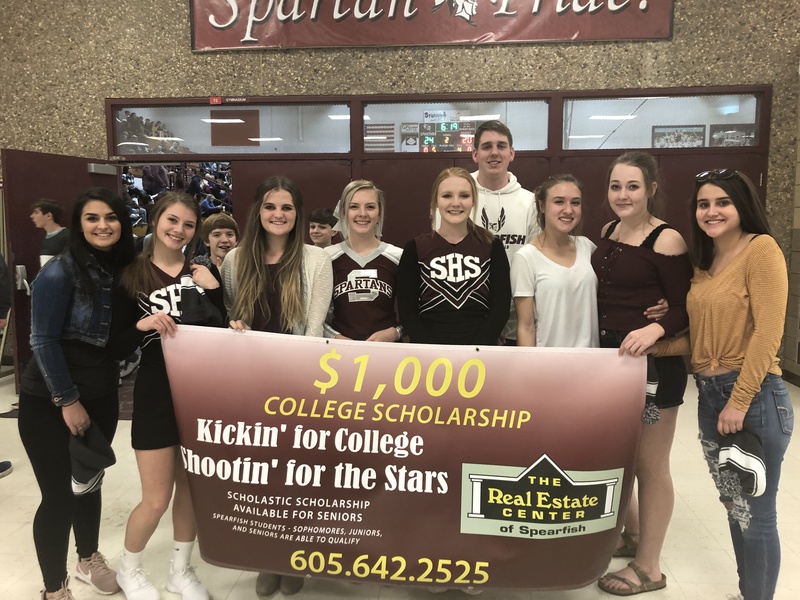 The Real Estate Center of Spearfish would like to extend a big THANK YOU to all the Spartan High School Students who participated in this year’s $1,000 College Scholarship program! Our last Shootin for the Stars event qualified two more student’s for the drawing. Congratulations to Jackson Jones and John Nickles for making the 3 point basket! Other students who competed include Alivia Ruff, Mady Pfiefle, Dawson Sundstad, Savanna Sewell, Chelsea Willliams, Kora Lloyd, Carter Thorman, and Jenna Geist. Thank you again for your participation and for making this another successful year! 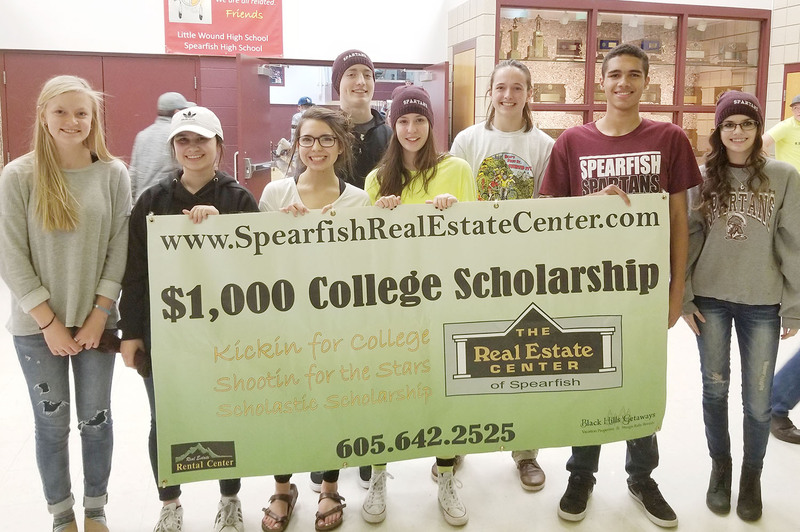 The Real Estate Center of Spearfish is also continuing to accept applications for the $1,000 Scholastic Scholarship offered to Spearfish senior students graduating in 2018. Applications are available at the SHS Guidance office, or can be printed online at www.SpearfishRealEstateCenter.com. Completed applications should be returned to the Real Estate Center or the SHS Guidance Office by April 15, 2018. Your Final Chance to Shoot for $1,000! The Real Estate Center of Spearfish held 2 more Shootin for the Stars events, during half time, at recent Spartan home basketball games. Students took their turn at shooting a 3-point basket, in hopes of qualifying for the $1,000 College Scholarship drawing. Congratulations to Carter Thorman for making the 3 point basket and qualifying for the $1,000 Scholarship drawing sponsored by the Real Estate Center of Spearfish. The following students also competed for the 3 point shot: Mady Pfiefle, Chandi Jackson, Conrad Thorman, Hunter Seyer, John Nickels, Grace Cihak, Jacob Johnson, Savannah Jewell, Sam Tobin, Taylor Niehaus, Nicole Meza, Bella Reid, Ryan Harris, DeMarco Orange, McKenna DuPont, Chase Huseby, and Chelsea Williams. There is one more opportunity to qualify for the $1,000 Scholarship drawing at the girls’ home basketball game on January 30. The drawing for the $1,000 College Scholarship will also take place that night! 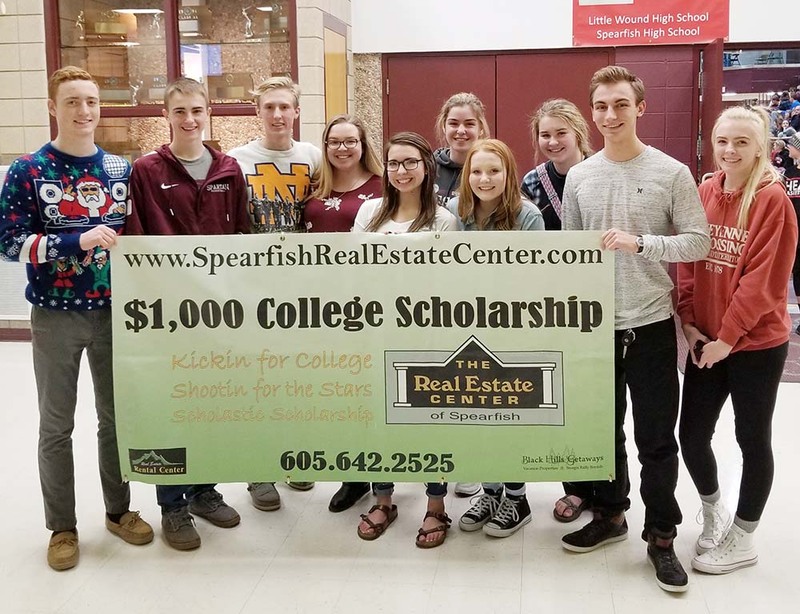 The Real Estate Center of Spearfish is also offering a $1,000 Scholastic Scholarship to a qualified senior graduating in 2018. Applications are available at the SHS guidance office or our website. Deadline for application is April 15, 2018.
for your chance to win a FREE chair! Students Continue to Shoot for $1,000! 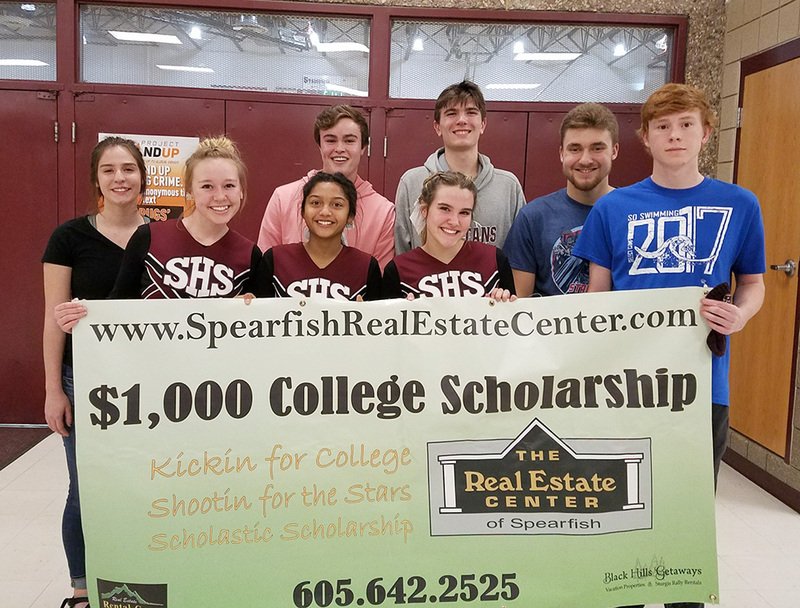 Congratulations to Ryan Peldo for shooting a 3 point basketball, at a recent Spartan game, qualifying him for a $1,000 Scholarship drawing sponsored by the Real Estate Center of Spearfish. 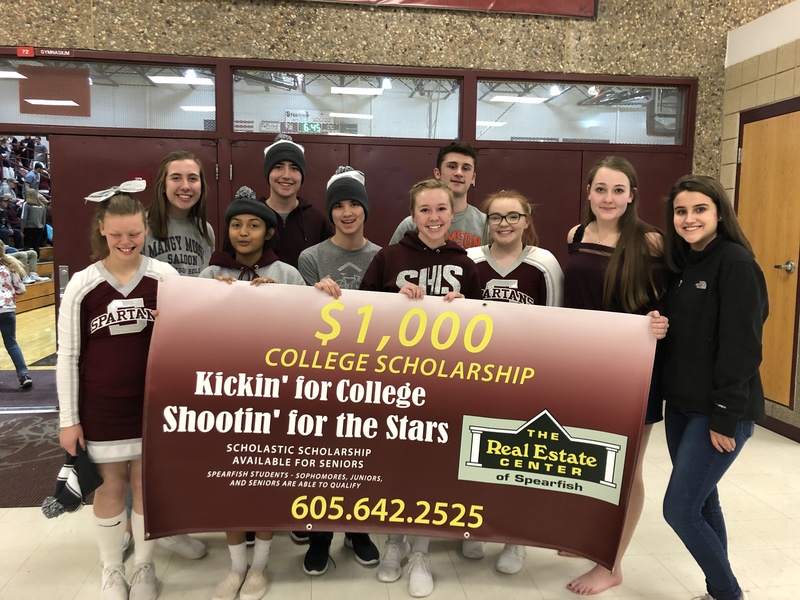 Ten students took their turn at shooting a 3-point basket during the Real Estate Center of Spearfish’s Shootin for the Stars Event, in hopes of qualifying for the $1,000 College Scholarship drawing to be held at the end of the basketball season. Other students who shot a basket include Jenna Geist, Brayden Case, Ellie Greger, Kora Lloyd, Braeden Ferguson, Tatiana Towry, Derik West, Nicole Meza, and Sydney Spraitz. There are two more opportunities to qualify for the $1,000 Scholarship drawing at the following home basketball games: Jan 9 and 30. 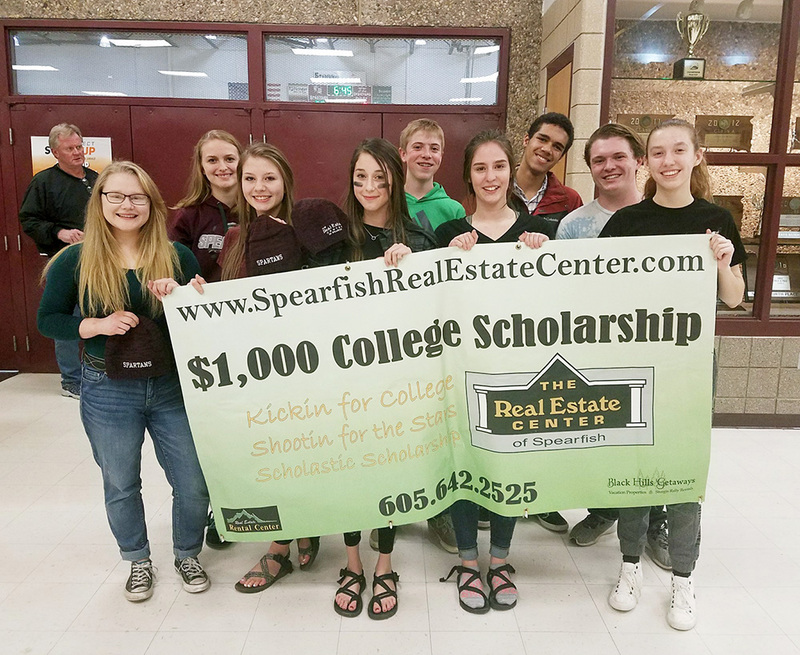 The Real Estate Center of Spearfish is also offering a $1,000 Scholastic Scholarship to a qualified senior graduating in 2018. Applications are available at the SHS guidance office or on our website. Deadline for application is April 15, 2018. 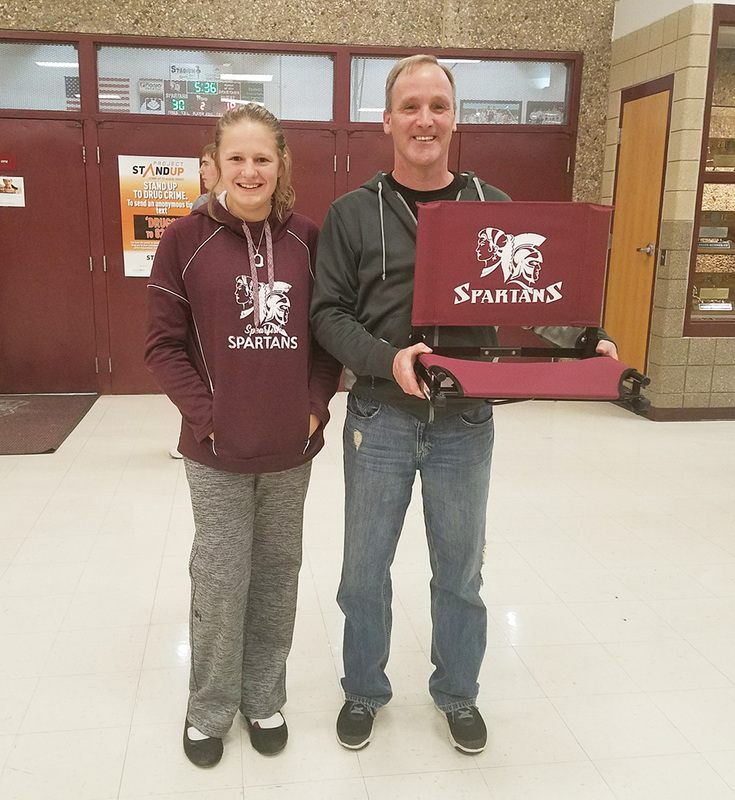 Steve Case, winner of a FREE Spartan wrapped Stadium Chair. January 9 and Tuesday, January 30 for your chance to win a FREE chair! Enthusiastic Spartan high school students lined up at a recent home basketball game for their chance to shoot a 3 point basket during half time! Congratulations to John Nickles for making the 3 point shot. 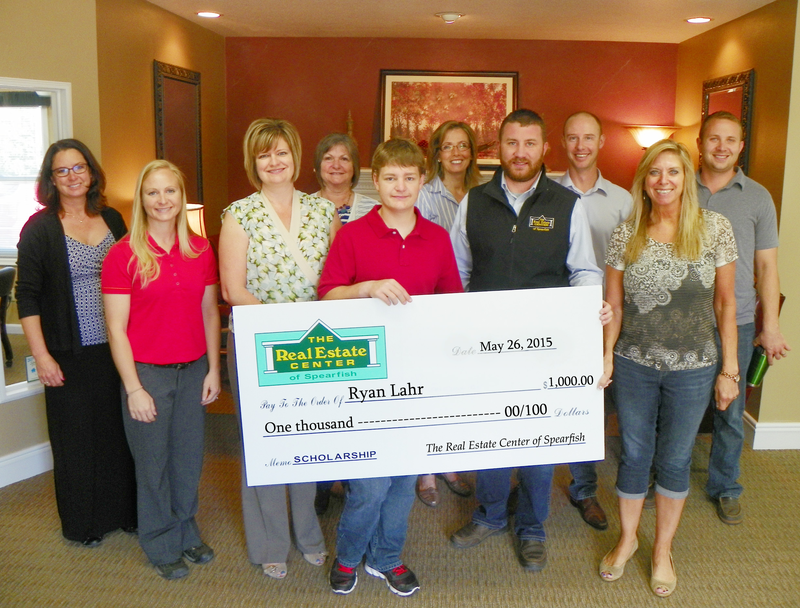 John’s name goes in the drawing for a $1,000 Scholarship sponsored by the Real Estate Center of Spearfish! The drawing will take place at the end of the basketball season. Other students who competed for the 3 point basket include Cody Hall, Carter Thorman, Carolyn Petersen, Zac Zwaschka, Sydney Carlbom, Drake Dittman, Chandi Jackson, Jenna Geist, and Conrad Thorman. You have a few more opportunities to Shoot for a basket at the following home Spartan games: Jan 9 and 30. 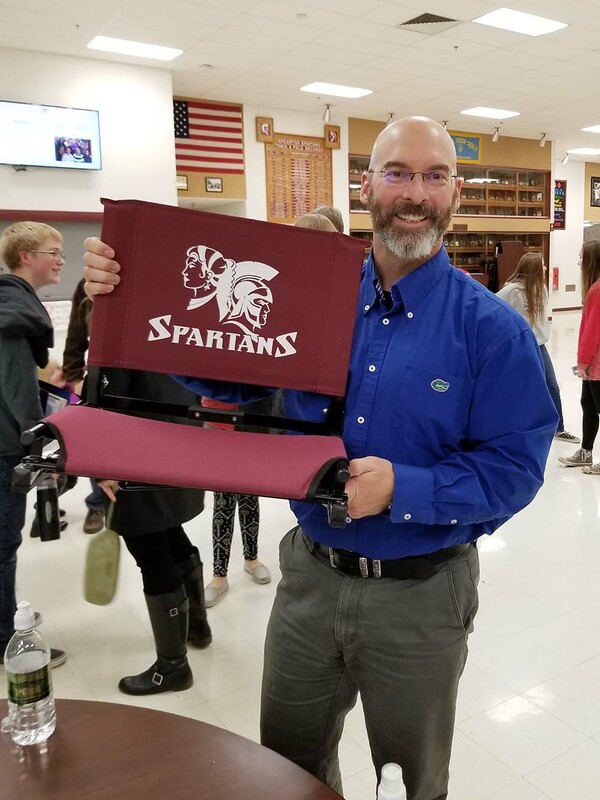 The Real Estate Center of Spearfish would also like to congratulate the winner of the FREE Spartan wrapped Stadium Chair. Sign up with a Spearfish Real Estate Agent at the basketball games on Tuesday, January 9 for your chance to win a FREE chair! 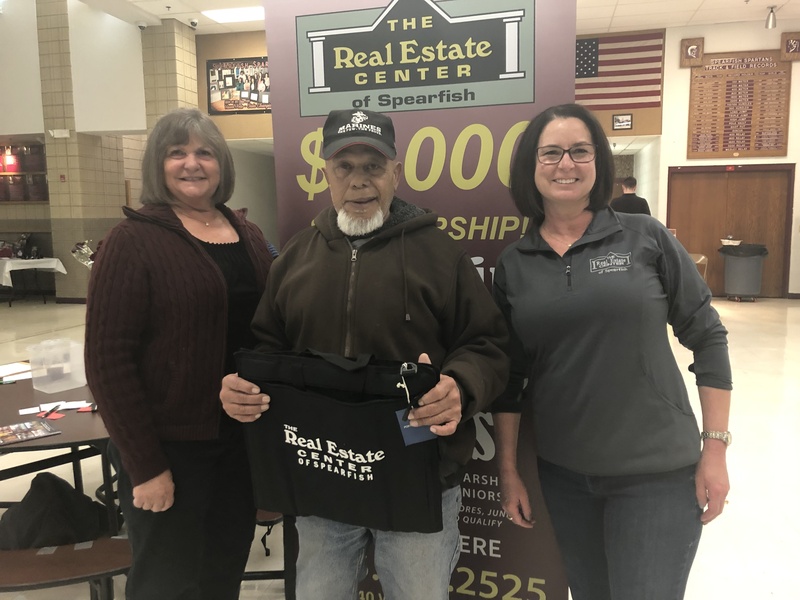 The Real Estate Center of Spearfish held a Shootin for the Stars event at a recent Spartan home basketball game. Students took their turn at shooting a 3-point basket, in hopes of qualifying for the $1,000 College Scholarship drawing to be held at the end of the basketball season. 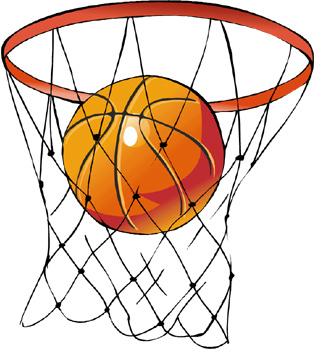 The following students shot a basket: DeMarco Orange, Anna Schneiter, Mady Pfeifle, Braeden Ferguson, Tatiana Towry, Carissa Hoffmeyer, Isaiah, Childers, and Tiff Valentine. There are eight more opportunities to qualify for the $1,000 Scholarship drawing at the following home basketball games: Dec 19 and Jan 9, 30. See you at the games! Spartan Student’s Shoot for $1,000! Spartan students lined up to shoot a basket, during half, at the home basketball game last Friday night. Students who competed for the basket included Kody Koistinnen, Cam Paisley, Conrad Thorman, Dillon Batka, Isaac Engelhart, Brock Pentleny, Carter Thorman, Cradon Harris, Logan Lucas, and Emma Murphy. 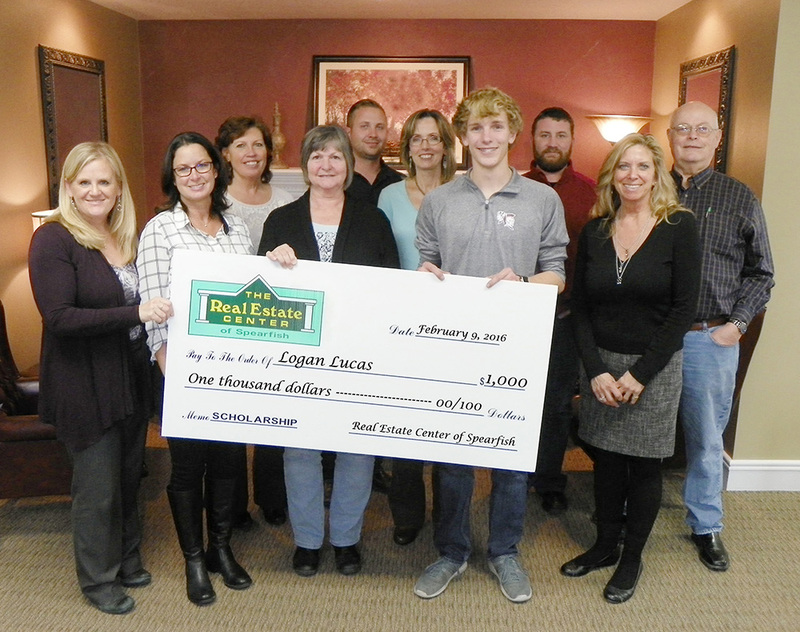 The $1,000 College Scholarship, sponsored by the Real Estate Center of Spearfish, will be drawn at the end of the basketball season. Spartan students (sophomores, juniors and seniors) have eight more opportunities to shoot a basket and become eligible for the $1,000 Scholarship: Dec 19 and Jan 9, 30. 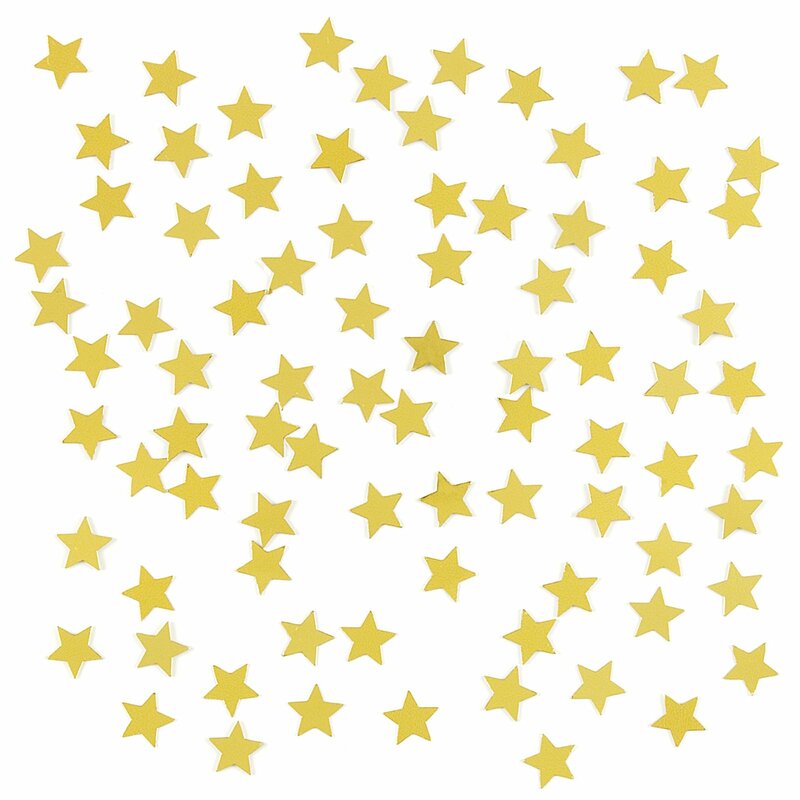 Are you Ready to Shoot for the Stars?! Attention all Sophomore, Junior and Senior Spartan High School Students! 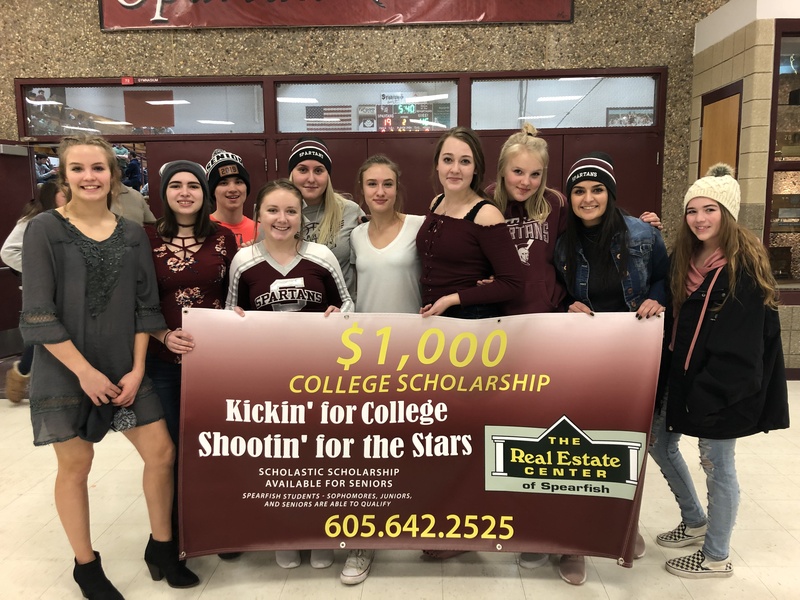 It's the start of another Shootin for the Stars season, which means you have the opportunity to qualify for a $1,000 College Scholarship offered by the Real Estate Center of Spearfish! Come to the 10 selected home basketball games and enter your name for a chance to shoot a basket at half time. Students who make the 3 point basket will be entered into the Scholarship drawing, which will be awarded to one student at the end of the season. Scholarship money is to be used at the beginning of your second semester in college. Your first opportunity to shoot will be at the and girls’ and boys’ basketball games on Friday, December 8 starting at 6:00pm. We hope to see you there! Come to the selected Spartan home basketball games. All Spearfish High School Students, who show their Student ID, will have the opportunity to enter their name into a drawing. At half-time, ten tickets will be chosen from that drawing. Those ten Students will get an opportunity to shoot a basket. If successful, then their name goes into a drawing for the $1,000 Scholarship that will be drawn at the end of the basketball season. Only one name will be drawn from all of the entries and that Student will win $1,000 from the Real Estate Center of Spearfish, payable to the college (or vocational school) of their choice. Scholarship money is to be used at the beginning of their second semester in that school. 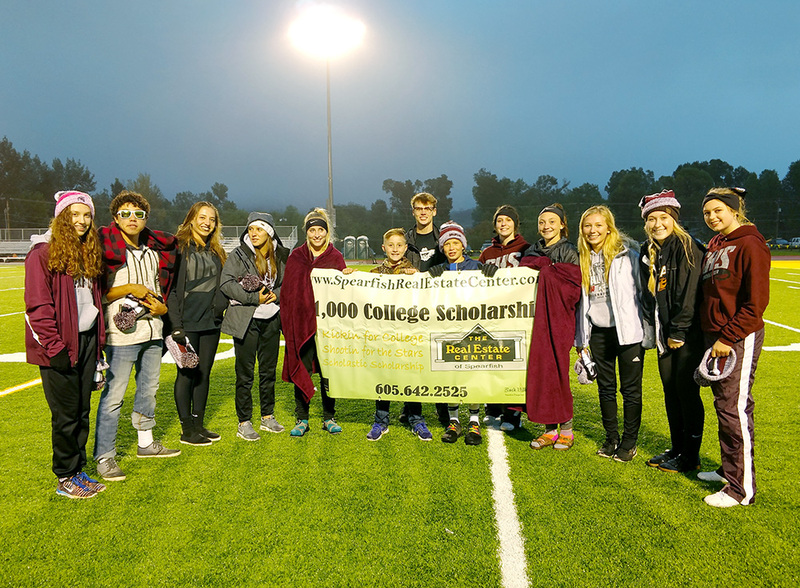 Ten students lined up during half time at the Spartan home football game last Friday night, to kick a field goal that would qualify them for a $1,000 College Scholarship drawing sponsored by the Real Estate Center of Spearfish. Congratulations to Sage Forsting and Lorenzio Tobar for successfully making the field goal! They are now qualified for the $1,000 College Scholarship drawing that will take place at the end of the basketball season. Other students who participated were Mady Gould, Cody Garness, Maddie Pfeifle, Alexis Kemp, Jacey Keller, Lauren Hight, Alana Hoven, and Bella Reid. You have another opportunity to qualify for the $1,000 College Scholarship at the home football game on Friday, October 6. 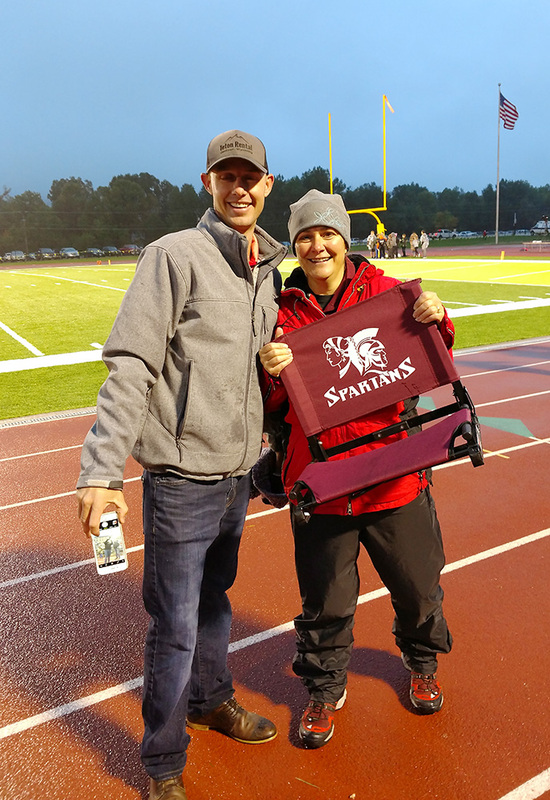 The Real Estate Center of Spearfish would also like to congratulate Holly Hanson on winning the FREE Spartan wrapped Stadium Chair. 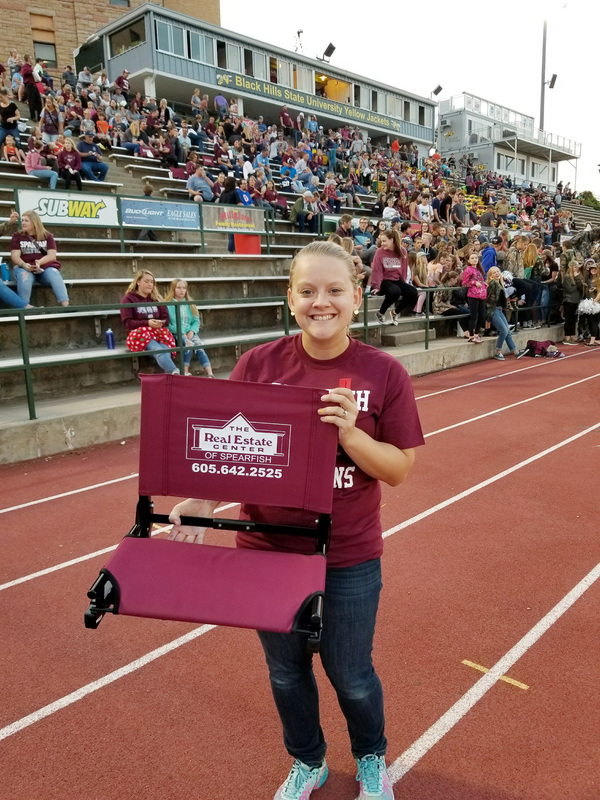 Sign up with a Spearfish Real Estate Agent at the football game on Friday, October 6 for your chance to win a FREE chair! *Holly Hanson is pictured with Kade Welfl, Owner/Broker Associate at the Real Estate Center of Spearfish. Congratulations to Emma Murphy and Maddy Boe for successfully kicking a field goal at the Spartan home football game last Friday night! 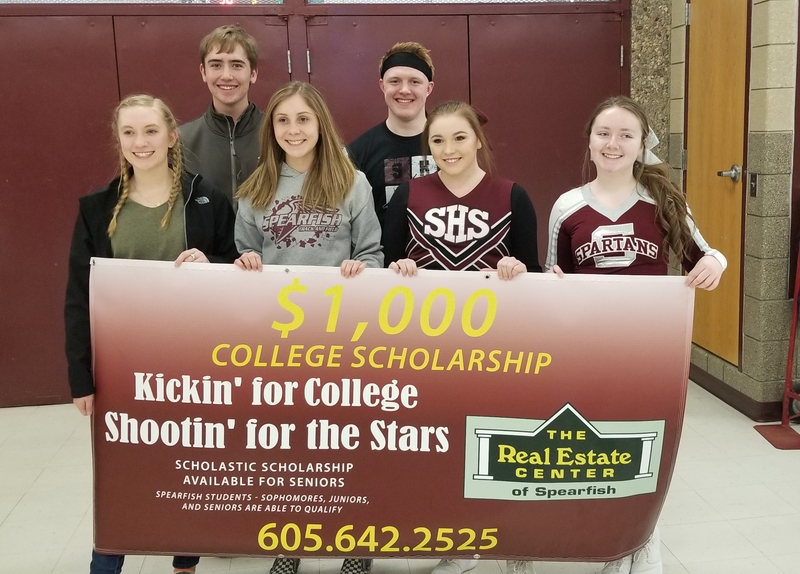 The field goal qualifies them for the $1,000 Scholarship drawing sponsored by the Real Estate Center of Spearfish, to be drawn at the end of the basketball season. Other students who kicked were Ryan Rafferty, Conrad Foreman, Mason Krier, Ashley Burr, Maddie Pfeifle, Chelsea Williams, Echoe Palmgren, and Sydney Carlbom. 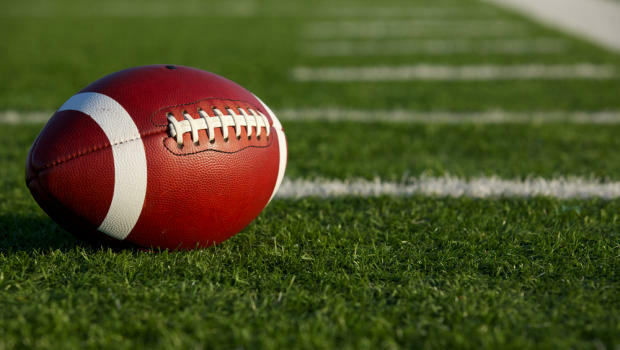 There are two more footballs games where you will have the opportunity to qualify for the $1,000 Scholarship: September 15 and October 6.
opportunity to win a FREE chair! 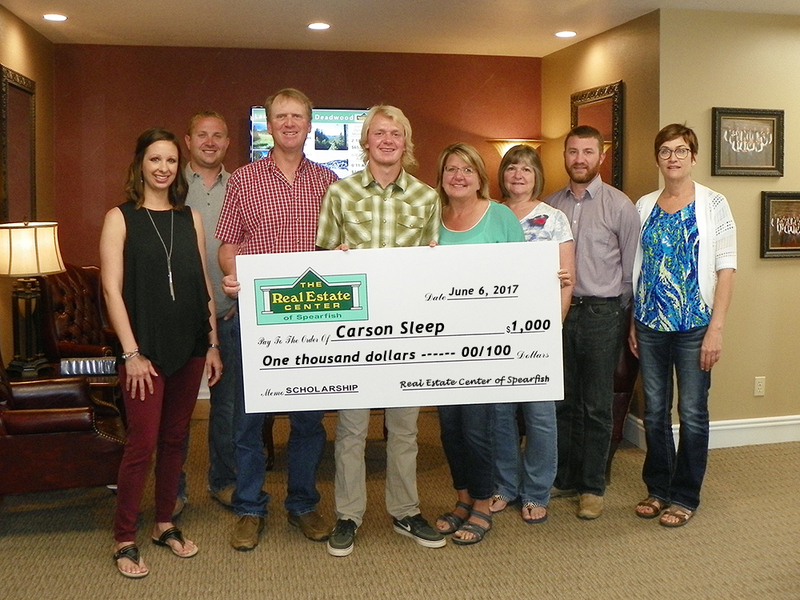 Spearfish high school senior, Carson Sleep, was recently awarded a $1,000 Scholastic Scholarship sponsored by the Real Estate Center of Spearfish! Carson plans to attend South Dakota State University in the fall, to pursue a degree in Agricultural Business. Our team is enthusiastic about helping the young people in our community pursue higher education through the gifting of our annual $1,000 College Scholarships! 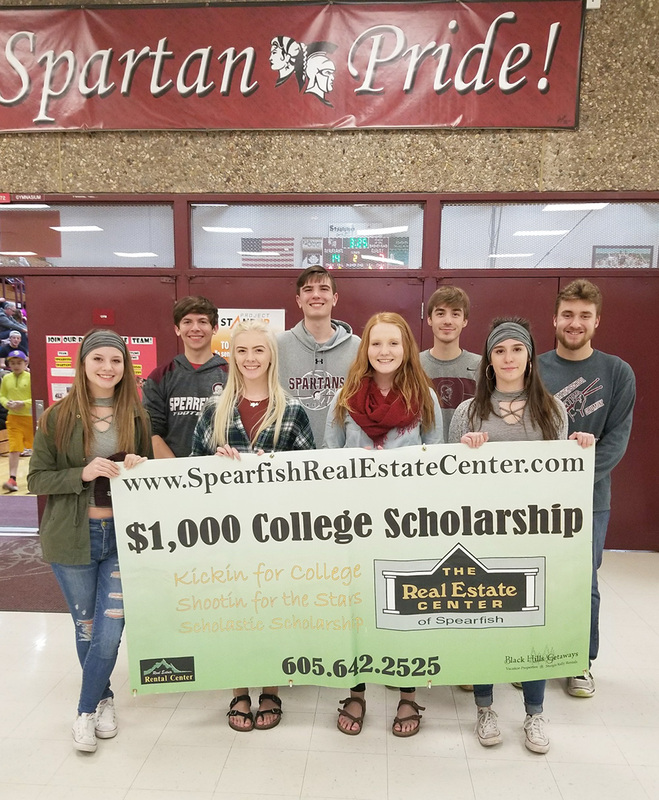 Please visit our website to learn how Spearfish high school students can qualify for a $1,000 College Scholarship in the upcoming school year. Sela was awarded the 2017 - $1,000 College Scholarship sponsored by the Real Estate Center of Spearfish! Our team is enthusiastic about helping the young people in our community pursue higher education through the gifting of our annual $1,000 College Scholarships! The Real Estate Center of Spearfish is dedicated to servicing the needs of their growing community with dedicated quality service. Thank you for allowing us to partner with you! 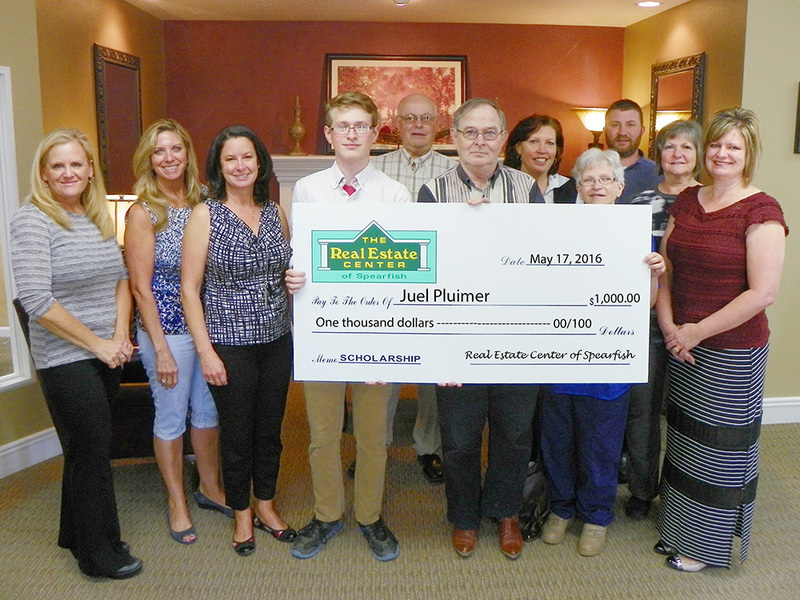 Congratulations to Juel Pluimer, awarded our 2016 $1,000 Scholastic Scholarship sponsored by the Real Estate Center of Spearfish! Our team is enthusiastic about helping the young people in our community pursue higher education through the gifting of our annual $1,000 College Scholarships! Spearfish high school students can learn how to qualify for a $1,000 College Scholarship in the upcoming school year, by scrolling down. The Real Estate Center of Spearfish is dedicated to servicing the needs of their growing community with dedicated quality service. Thank you for allowing us to partner with you! (l-r) Lori Caldwell (Owner/Broker Associate), Sue Cramer (Owner/Managing Broker), Polly Garrett (Owner/Broker Associate), Juel Pluimer (Scholarship Recipient), Ben Mahoney (Broker Associate), Juel Pluimer Sr. (Recipient’s Father), LuAnn Bice (Broker Associate), Diane Pluimer (Recipient’s Mother), Jason Richards (Owner/Broker Associate), Beth Mathis (Owner/Broker Associate) and Kari Engen (Owner/Broker Associate). Kade Welfl (Owner/Broker Associate), Ryan Wordeman (Owner/Broker Associate), Pattie Parrett (Broker Associate), Mitch Moe (Broker Associate) and Kim Hamilton (Broker Associate). 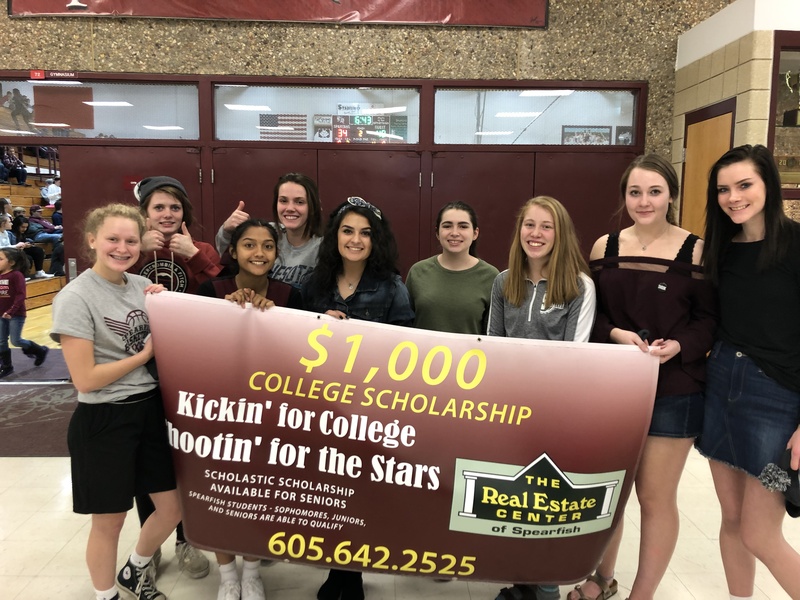 Congratulations to Logan Lucas who was awarded the 2016 $1,000 College Scholarship (Kickin for College/ Shootin for the Stars) sponsored by the Real Estate Center of Spearfish! Our team is enthusiastic about helping the young people in our community pursue higher education through the gifting of our annual $1,000 College Scholarships! 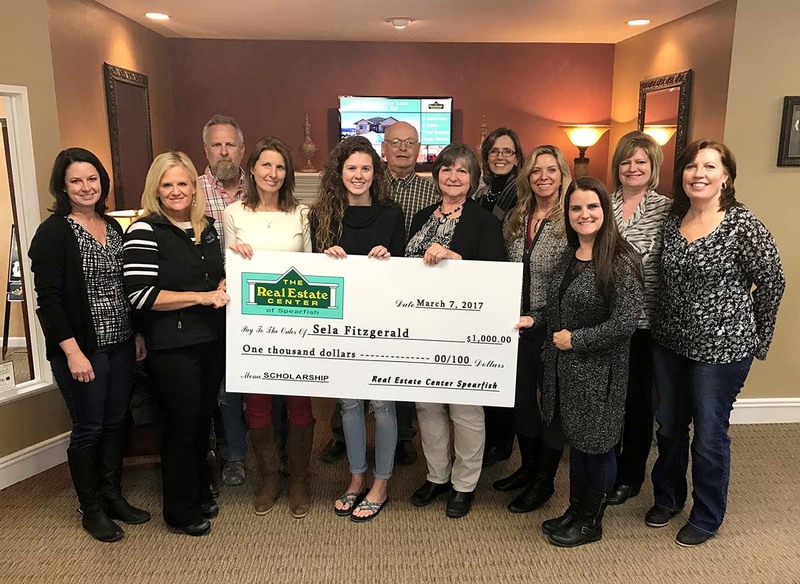 (Front l-r) Lori Caldwell (Owner/Broker Associate), Polly Garrett (Owner/Broker Associate), Beth Mathis (Owner/Broker Associate), Logan Lucas (Scholarship Recipient) and Sue Cramer (Owner/Managing Broker). Kari Engen (Owner/Broker Associate), Kade Welfl (Owner/Broker Associate), Mitch Moe (Broker Associate) and Kim Hamilton (Broker Associate). CONGRATULATIONS to Ryan Lahr, this year’s $1,000 Kickin for College/Shootin for the Stars Scholarship recipient!! His plans are to pursue a Business major at Black Hills State University this fall. Each year the Real Estate Center of Spearfish team is pleased to present the young people of Spearfish with the opportunity to further their education. We are honored to give back to a community that has given so much to us! 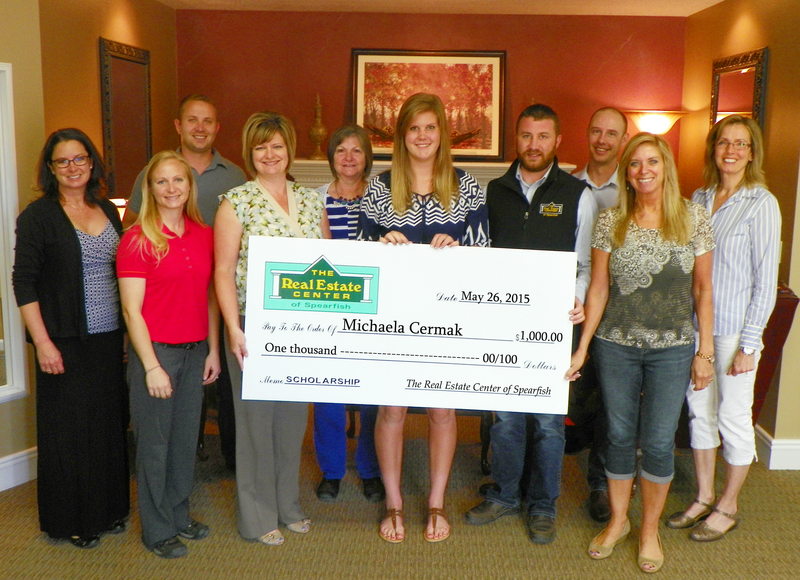 Congratulations to Michaela Cermak, whom we recently awarded the 2015 $1,000 Scholastic Scholarship! Our team is enthusiastic about helping the young people in our community pursue higher education through the gifting of our annual $1,000 College Scholarships. We are dedicated to servicing the needs of our growing community with dedicated quality service. Thank you for allowing us to partner with you!